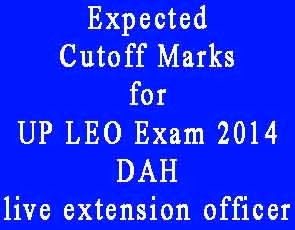 Department of Animal husbandry Uttar Pradesh DAHUP conducted a common written examination form the posts of पशुधन प्रसार अधिकारी / live extension officer or LEO posts. DAHUP LEO / Pashudhan Prasar Adhikari Written Exam was held on 2 February 2014 in various district of Uttar pradesh. After the recruitment process these Live Extension officer will be appointed in the pay scale of rs 5200-20200 and grade pay rs 2800 rs . 90% posts of Pashu dhan Prasar Adhikari will be filled via direct vacancy. Our few friends also participated in the written examination of Pashudhan Prasar adhikari posts. They share there exam experience with us. They told that question paper was not so much difficult and easily to attempt question in given time. LEO पशुधन प्रसार अधिकारी written exam question paper contains 100 question form various subject. total 1 hour and 30 minutes had given for attempting the question paper. Question was related to Hindi Subject, General study, Zoology, Botany and agriculture subjects. Difficulty level of the question paper was intermediate level. all question was objective type of the nature and those aspirant who cover the intermediate syllabus of Biology (Botany + zoology ) of Up Board (UP madhymik Shiksha parishad ) they can easily score good marks. Question of general study GS was related to latest current even and mostly question were related to GS of uttar pradesh. Question of Hindi subject was objective type. Mostly question was related to Hindi grammar. What do you think what will be expected cutoff marks LEO posts. ? As we get Final answer key / Answer sheet and Results news from the official website of DAH / dahup.in/ , Mexam.IN will inform you immediately . so stay in touch. its my according, if any mistake please give sugesions. final answer key may be varry…..
Apka selection ho gya kya? write answer is 8 ATP because in glycolysis total 8 ATP is formed. while the end product of glycolysis is 2ATP and 2 pyruvic acid. write answer is 1 molecule because for conversion of pyruvic acid in to acetyal co-A 1 molecule of oxygen is required (refrence to sharma and sharma UP board book page no. 625) lakin mae god say pray kerta hu ke aap ka answer he sahe ho kyu ke by mistake mae 2 molecule answer ker k aya hu. Write answer is Cambrian period. because silurian period is the ages of fish. i am also bio student belong to OBC . u know mujko 5 question k answer nahe pata chal pa rahae thay jo aap nae bata diya jismae sae 2 sahe ho gayae lakin 2 question aisae bhe thay jinko mae sahe saamaj raha tha magar aap k answer sae mae satisfied honae k baad mae samajh gaya ke wo galat ho gaya. abhe to chunao achar sanhits lag hae to result to ab june - july k baad he aa payega tab tak animal husbandary mae sab jugar chal raha hoga . sab ko jugar ka badia time mil gaya hae. ur answers for 62. cambrian period may be right. que.35 nematocyst developed from interstitial cells is right, nimatocyst found in ectoderm but developed from interstitial cells of ectoderm. I have no confusion that's why i am not calling u. sorry but your Question no 53 is also wrong the write answer is pokliothermic.and amniotic your question no 93 write answer is ethyline not the auxine hormones. Result aa gaya hai..mera written me selection ho gaya hai dosto..mere 73 ques correct the.